NGVAmerica, the American Public Gas Association (APGA) and the American Gas Association (AGA) have advised details of their 2nd Annual ‘From Sea-to-Shining-Sea’ NGV Road Rally Across America. 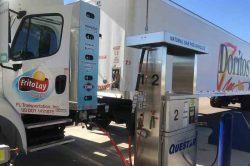 The event highlights the many benefits of using natural gas in transportation and the variety of vehicles available today that operate on natural gas over a two-week period, commencing this June. This year’s 18-stop, 4,825-mile journey starts outside of Long Beach, CA on Monday, June 5th and concludes in Washington, DC on Friday, June 16th. Event media stops, associated promotion events and a spur rally kicking off from Fair Oaks, Indiana, are all part of the colourful rally. Each Drive NatGas road rally stop includes good food, a variety of NGVs, award ceremonies and educational opportunities that highlight NGVs’ exemplary value proposition. All are welcome and attendees will include state and local government officials and policymakers, the media, NGV customers and advocates, industry stakeholders, DOE Clean Cities coordinators as well as the public. NGVAmerica and the American Gas Association are members of NGV Global.